In the past week I have surveyed dozens of sales managers about tools and solutions they need to help their sales teams be more productive. The managers shared their insights and opinions on what is needed to be successful in selling. When I analyze these expert sales managers’ feedback, the key ingredient or “secret” to high sales productivity is ACTION! Successful sales professionals take action when others don’t and actions that others won’t. Ernest Hemingway said, “Never mistake motion for action.” This is so true in sales! We can be in motion but not going anywhere. Action means productively moving forward. The activities of planning, preparation, research, reworking value propositions, and putting together effective presentations are all important. But without action with clients or prospects, those activities are insignificant. The sales professionals I work with to increase selling skills intellectually agree with the tools, steps and behaviors we outline and practice. What makes the difference in results is that the most successful people immediately put these ideas, skills and tools into action in sales calls. And they make sales. The others make excuses why they couldn’t use them, get caught up in busy work and then are surprised when sales don’t happen. 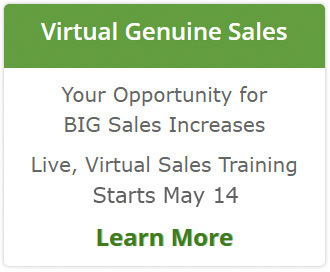 Want to increase your sales results? It’s really not a secret after all…move beyond activities that are just motion and take purposeful and consistent ACTION with your customers!